Social stigma and unequal laws make it harder for lesbian, gay, bisexual and transgender (LGBT) elders to achieve three key elements of successful aging: financial security, good health and healthcare, and social support and community engagement. Improving the Lives of LGBT Older Adults provides an overview of the unique challenges and inequities facing LGBT elders. It also offers detailed recommendations for eliminating—or at least reducing—inequities and improving the lives, and life chances, of LGBT older Americans. Movement Advancement Project and SAGE. March 2010. Improving the Lives of LGBT Older Adults. http://www.lgbtmap.org/improving-the-lives-of-lgbt-older-adults. Although largely invisible until very recently, lesbian, gay, bisexual and transgender (LGBT) older adults make up a significant (and growing) share of both the overall LGBT population and the larger 65+ population. While confronted with the same challenges that face all people as they age, LGBT elders also face an array of unique barriers and inequalities that can stand in the way of a healthy and rewarding later life. The additional challenges to successful aging faced by LGBT elders are gaining visibility with the aging of LGBT Baby Boomers, who are the first generation of LGBT people to have lived openly gay or transgender lives in large numbers. Improving the Lives of LGBT Older Adults aims to provide LGBT and mainstream aging organizations, Americans and their elected leaders with information, inspiration and ideas for improving the lives of LGBT older adults. The report outlines why and how LGBT elders face additional obstacles to successful aging, and lays the groundwork for solutions that will benefit all Americans, whether young, old, heterosexual or LGBT. The report is the first collaboration between LGBT organizations and mainstream aging organizations to examine the lives of LGBT older adults. 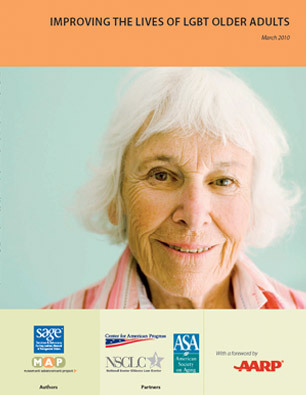 It was co-authored by the Movement Advancement Project (MAP) and Services & Advocacy for Gay, Lesbian, Bisexual & Transgender Elders (SAGE) in partnership with the American Society on Aging, the National Senior Citizens Law Center, and the Center for American Progress, with a foreword from the American Association of Retired Persons (AARP).